Sometimes it rains. And you get wet. And you stop and wait for the rain to pass under a tree while you eat chocolate. And mom is kinda mad. Then you go home. Looking forward to some better weather. 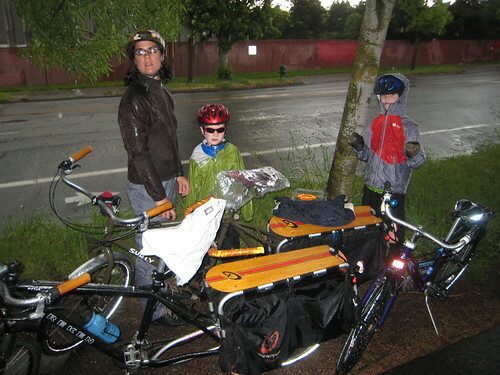 This entry was posted in bikes, Burke-Gilman Trail, kids, weather and tagged Bike Month, cold, May, rain, seattle, wet. Bookmark the permalink. I have been totally drenched three times in the last 7 days. I try not to be too cranky about it…but sometimes cranky wins. I’m going to buy some rain pants tonight, which means the weather will instantly get better! I realize it’s probably not an issue in Seattle, but everyplace I’ve lived with substantial rain has always been thunderstorm country, so that photos makes me cringe a little! Trees = lightning magnets. @Kendra: I thought I remembered you having rain pants? No, then yes, help the weather and get some. @Richard Masoner: agreed about the risk in lightning country. Though sometimes we’d like a little electricity action to liven up our drizzle, we only get it maybe two times a year and when it does come, it’s a different kind of weather — and usually isn’t even raining. Yup, it happens. At the moment it’s happening a lot too. I find a big leather cowboy hat is effective at keeping head and neck dry, but hiding under a tree is sometimes the only solution. Thunderstorms tend to build up slowly and give lots of warning to get out from under trees. I love that the little guy is wearing sunglasses. Mine always rides in either his sunglasses or his ski goggles when it rains… something about the rain hitting his eyes makes him crazy. And sometimes you take a whole bunch of young Kidical Mass riders into a bar halfway through the ride. @Andy, the cowboy hat sounds like a great idea. @ Betsy – we usually wear sunglasses for the bugs…but in this case, they protected his eyes from the rain. @Julian – dang, we were so close, yet so far away. We thought about pressing on, but it was so very wet….I think we made a good choice to bail. next time, definitely. Yeah, this weather definitely bites the big one for biking. hasn’t this been the worst spring? and what makes it so tragic, was the abnormally beautiful, dry winter. oh well! Shucks, you should have come out for Memorial Day – the sun came out halfway through the ride, and guys were removing clothing and getting unabashedly sunburned. The ladies were a bit more reserved, but I did see some serious basking going on. Sorry we missed it – sounds like it was lovely! Finally, I get the pictures up – they are here: http://tinyurl.com/2dul9eb Truly lovely, it was.